Search tools aren’t just for SEO, they can also be useful in getting a sense of what content your audience might be interested in. There is a big caveat with this approach: it is backward-looking, focusing on previous performance. However, it’s handy — if you don’t over-rely on it. Should we assign a summer reading article on beach books or fun summer reads? Google Trends gives us a quick snapshot of the popularity of this search phrase. Google Adwords (login required) goes a bit deeper, offering number of searches and advertising competition for the term. Adwords tells us that “Summer Reading” receives an average of 35,000 monthly searches. If this is a true annual monthly average, we can assume that the actual number of searches during periods of key interest is much higher. Adwords also shows us that there is low advertising competition for the term, which is helpful because that means the top listings won’t include too many advertisers. So, yes. Google confirms that it is a good idea to publish this content. 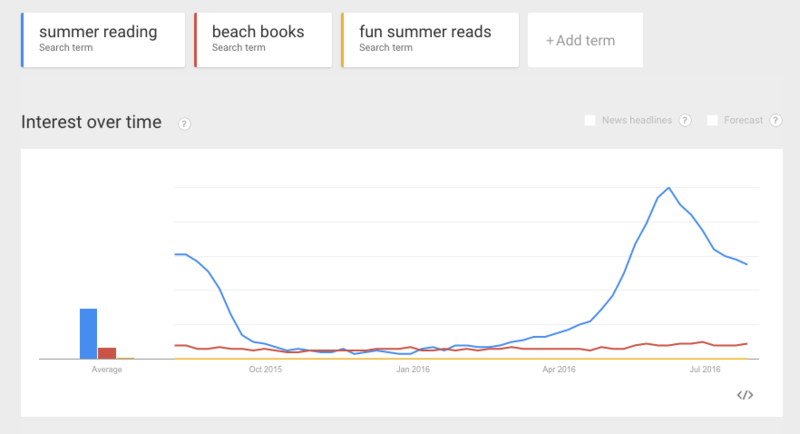 And, of course, the chart shows us that “summer reading” receives far more searches than either “beach reads” or “fun summer reads,” so now we have our keyword phrase. One other issue to consider, is this an artificial spike in traffic (possibly a movie title or a news event) or is this content evergreen?